“The Show”. This term has become as ubiquitous as “falling off the cliff” and “DRS” in the past few years. Formula One has become obsessed with spicing up the entertainment on track, with the introduction of short life tyres, DRS and now a reformed qualifying session. But the real question remains, have all these changes had the desired effect or are they in fact turning fans off the sport? Well, if you believe the results from a variety of the extensive fan surveys carried out in the past few years, these new rules to spice up “the show” have had the opposite effect. In a survey compiled last Summer with Autosport, Motorsport News and F1 Racing magazines found from their results that 73.9% of fans were against using artificial methods to tighten up the races. These findings are supported by a separate GPDA survey also revealed last year. From over 200 000 fans took part, with the findings suggesting fans are against the gimmicks in place within the sport. Many of the fans from these survey’s were long time followers of Formula One, but in recent years an increasing number have been switching off. The majority of fans suggested their favourite decade of the sport was the 1990’s, and as an obsessed F1 fan I can only agree with their assessment. Growing up in this decade my earliest memories of F1 and motorsport in general came from this decade. It was this era of Formula One, with the sculpted beauty of the cars matched with the shrieking V10 engines got me hooked on the sport, something that continues to this day. It was the ferocious speed and ear splitting sounds that attracted the majority of fans to the sport, captivated with dare devil drivers peddling the fastest racing cars on earth. In the current era this no longer seems to be the case. With the continuing technological advancement in the sport, some of the old magic has been lost. Whilst the cars are still the fastest racing machines on the planet, it no longer looks or sounds that way to some of the spectators. With the new 1.6 litre turbo engines a big criticism of the technology is the relative lack of sound made from them. Efforts have been made to address this issue, however thankfully the once tested megaphone exhaust idea never caught on. Nico Rosberg testing the megaphone exhaust system at Barcelona during the 2014 season. Thankfully the idea never caught on and didn’t have much of an effect. Photo copyright Crash.net . The talk in the paddock currently surrounds making these breed of cars significantly faster, with a paddock held target of increasing the lap times of these cars by three seconds for next season. This is an attainable goal and would likely receive a lot of support from both drivers and fans alike. The ongoing political side of the sport is something that a lot of fans are simply not interested in, as many teams outside the top five struggle to survive in this highly expensive sport. This creates opportunities for relative “pay drivers” to muscle their way into Formula One. This is not something new and has long played a role in the sport, but as a fan it’s frustrating if you do not feel like the grid is filled with absolutely the best drivers in the sport. For many years the increasing quest for downforce has had a negative effect on the level of entertainment on track. The level of over taking was slowly decreasing through the 2000’s, and for many purist fans the advent of the new “DRS” drag reduction system has gone too much the other way. The sport has seemingly gone from one extreme to the other, as over taking used to be a very difficult task, it has now become ridiculously easy. Another big talking point for fans is the Pirelli tyres. They are specifically designed to have a short shelf life, forcing a majority of the races to be run at a controlled pace to save the tyres. Whilst this is not Pirelli’s fault, they are only creating the tyres they were asked to, it has left drivers and fans frustrated with the situation in races. It’s a cliche example but for many fans they will hold up some famous racing from the past to support their argument. Battles such as the one between the Ferrari of Gilles Villeneuve and Rene Arnoux at Dijon in 1979. Here is a link to a video of their titanic battle Gilles Villeneuve vs Rene Arnoux battle . The constant fighting and swapping positions shown in that battle are an increasingly rare sight in modern Formula One, and that is exactly why a lot of fans are struggling to remain devoted to the sport. These fans are not simply giving up on F1, they are simply choosing to explore different forms of motorsport. Sportscars are becoming increasingly attractive for many fans and drivers, along with GT racing, Indycar and the new Formula E championship. Speaking from a personal perspective again, I find myself increasingly following sportscars rather than F1. After catching up with the Rolex 24 at Daytona last month, the non-stop fighting for victory across the majority of the classes kept me hooked for 24 hours in a manner F1 has failed to do for a number of years. This is the genuine winning margin for the #4 Chevrolet Corvette in the GTLM class of last month’s Rolex 24. To be seperated by only a matter of feet after 24 hours of racing shows how competitive sportscar racing is currently and why it’s having a resurgence of interest. Photo copyright Motorsport.com . The level of competition and the quality of the field’s in modern series such as the World Endurance Championship, WeatherTech Sportscar Championship and Blancpain Endurance Series are converting a lot of fans to the long distance element of the sport. Right now it feels like modern sportscar racing is like F1 in it’s glory days. There is a lot of high quality drivers, teams and manufacturer’s involved, with flat out racing and constant battles to be found on track. It’s refreshing as a contrast to modern F1. By all means I still love and enjoy Formula One and always will do. I don’t intend for this piece to be a solid bashing of F1 because it has a lot of positive elements going for it currently and is deservedly the top series in world motorsport. I only wanted to express an opinion from one F1 fan that for even the die hard supporters of the pinnacle of motorsport, the increasing politics and gimmicks in the interest of “The Show” are leaving the purists feeling cold on F1. If someone who has religiously followed F1 since a very early age can feel like this, the problems with the sport run deeper than many people will think. Without the long term F1 fans the sport is left only with casual fans who will be a lot less likely to sustain the sport in the long run. For now I will still watch F1 as much as possible, it’s just now that sportscar racing takes precedent. That shows the current relative merits of both series within the motorsport fan base. What are your thoughts on this article? Please feel free to share your opinion and let me know. Also a huge thank you for reading this article. October 11th 2015: The Formula One paddock is eagerly anticipating the second ever Russian Grand Prix. 24 year old Dutchman Robin Frijns is eagerly anticipating race day. But whereas Lewis Hamilton and Sergio Perez steal the headlines in Sochi, Frijns is racing hundreds of miles away from the F1 paddock at the Zandvoort track in his native Holland. Now, you may ask what is surprising about this seemingly innocuous fact. A look at his junior single seater racing CV will tell all as to why this is a very strange occurrence indeed. Frijns was a regular go-karter in both France and Belgium, finishing his final year of karting in 2008 coming third in the highly competitive KF2 European championship and second in the French KF2 series. Having shown his talent on the highest level of junior karting, logically the next step was a move into cars. Before Max Verstappen blazed a trail last year by jumping straight from karting to the phenomenally difficult FIA European F3 championship, Frijns raised eyebrows in 2009 by making a similarly difficult step up to the Formula BMW Europe series. The series list of champions reads like a printout of the 2015 Formula One grid. Despite being a rookie Frijns made his mark on the series, finishing the year third in the points with one win and five further podiums. At age 18 Frijns had marked himself out as a young driver to watch in the motorsport universe. 2010 saw Frijns return to the series with the same Josef Kaufmann Racing team that propelled him to third the year before. Frijns was considered the pre-season title favourite, but he found himself in a close title battle all year with British driver Jack Harvey. Six wins and a penultimate race retirement for Harvey meant Frijns was crowned the 2010 Formula BMW Europe series champion by a scant margin of 11 points. Frijns tops the podium at the Hungaroring round of his victorious 2010 Formula BMW Europe campaign. Photo credit is unknown. Having taken the title in front of the Formula One paddock, Frijns was moving up to the next rung of the single seater ladder. Frijns had shown further proof of his talent with a guest appearance in the equally competitive Formula Renault 2.0 category. In a one-off outing for Kaufmann in the offshoot Northern European Cup series at Spa, Frijns made up for his lack of experience by claiming a second,fifth and a win in the three races. It was time for Frijns to move into the Formula Renault category full time in 2011, sticking with Josef Kaufmann racing to compete in the super competitive Formula Renault Eurocup. As a rookie Frijns once again left the motorsport community drooling, claiming the title in his first year with five wins and four other podiums. It’s notable that he beat current F1 drivers Carlos Sainz Jr, Daniil Kvyat and Will Stevens along with the F1 bound Stoffel Vandoorne to win the title, with all of them being Eurocup rookie’s. With Renault providing significant support through a scholarship scheme it was a obvious Frijns would be stepping up to the Renault World Series for 2012. With 3.5 litre engines and tons of downforce the series is seen as a rival of the GP2 series, the predominant F1 feeder series. The established Fortec motorsport team were the one’s to sign Frijns, with a top five in the championship the target for the talented rookie. Whilst the Eurocup title success had been a surprise, winning the Renault World Series title as a rookie shocked the single seater community. A third and a win on his debut weekend was a statement of intent, something he followed up with two further wins and four podiums. The final round at the Circuit de Catalunya was a three way title showdown between Frijns and the more experienced duo of Jules Bianchi and Sam Bird. His two rivals were both vastly more experienced and were closely affiliated with F1 teams. With the title coming down to the final race of the season, fireworks were predicted. Late on, the race exploded into life. On lap 21 Bianchi found his way past Frijns at the first portion of the lap, with Kevin Magnussen close behind. Several corners later Magnussen attempted to also pass Frijns, who moved to block him passing. This quick change of direction left him nowhere to go as it then appeared he pushed title rival Bianchi into the gravel trap as he attempted to stay on the track. 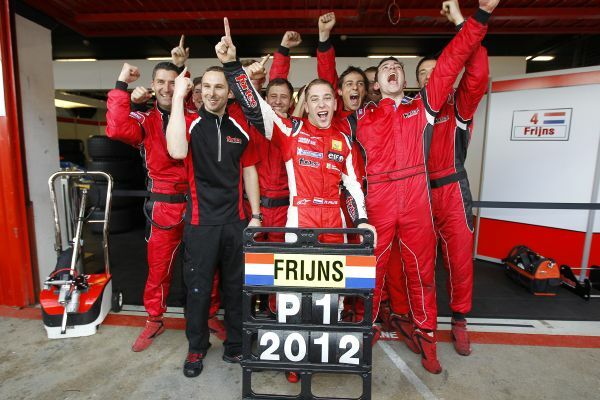 Frijns celebrating with his Fortec team after a contentious final round incident sealed the Renault World Series title for him. F1 beckoned. Photo sourced from automobilsport.com . This highly contentious collision led to a 25 second time penalty for Frijns, dropping him out of the points. In the end this penalty had no effect as Frijns was still able to claim the title over a disappointed Bird and furious Bianchi. Allegations were made by Bianchi post-race that Frijns deliberately made contact with Bianchi to push him off the track, allegations were were not investigated and furiously denied by Frijns himself. Despite the contentious nature of the victory, it was nevertheless a huge achievement for Frijns to win the Renault World Series title in his first season. This title win propelled Frijns into Formula One community. After a stellar junior racing career with little financial support, it at last appeared that Frijns was destined for F1. Frijns took part in the post-season F1 young driver test for the small Swiss Sauber team in Abu Dhabi, impressing enough on his day in the car to be announced at the team’s reserve driver soon after. Whilst it was not a race drive, it was a way to impress the F1 paddock with his time in the car throughout 2013. Both Frijns and Sauber were keen for him to continue racing in 2013, but with little financial support it was tough for him to progress into GP2. Impressive pre-season tests for the Trident and new Russian Time team showed Frijns deserved to be on the grid, but a lack of funding kept him off it for the opening round in Malaysia. For the second weekend of the season in Bahrain it was announced that Frijns would join the new Hilmer Motorsport team for a number of rounds. He qualified a respectable 10th on his debut, but an accident and his struggles adapting to the Pirelli tyres prevented him from attaining a good result. With a race by race shoestring budget Frijns was confirmed for the next round in Spain, and he showed his talent by claiming the feature race victory, cementing his status with a second in the shorter sprint race on Sunday morning. With the weekend supporting the Spanish Grand Prix, Frijns had once again shown the F1 paddock his talents as a driver. 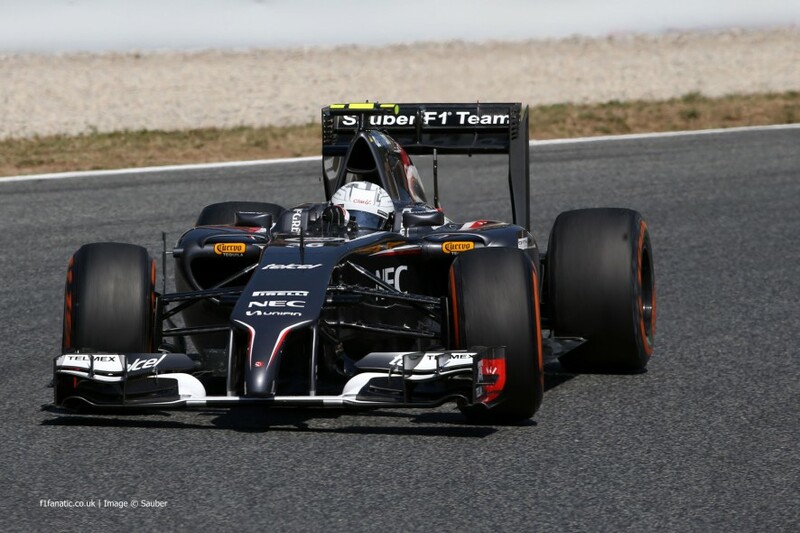 Frijns on his way to his only GP2 win of 2013 for the new Hilmer Motorsport team at Catalunya. Photo sourced from Formule1.nl . Alas, budget concerns and the lack of experience from the new team hindered Frijns for the rest of the season. He was only able to produce two more points scoring finishes as he completed only six of the eleven rounds in the championship. 2013 can be seen as the year his career momentum stalled, with a part GP2 season not offering much and his opportunities at Sauber were severely limited thanks to their grave financial concerns. He was not in the car much and at the end of the season was dropped because of his lack of funds he could bring to the team. 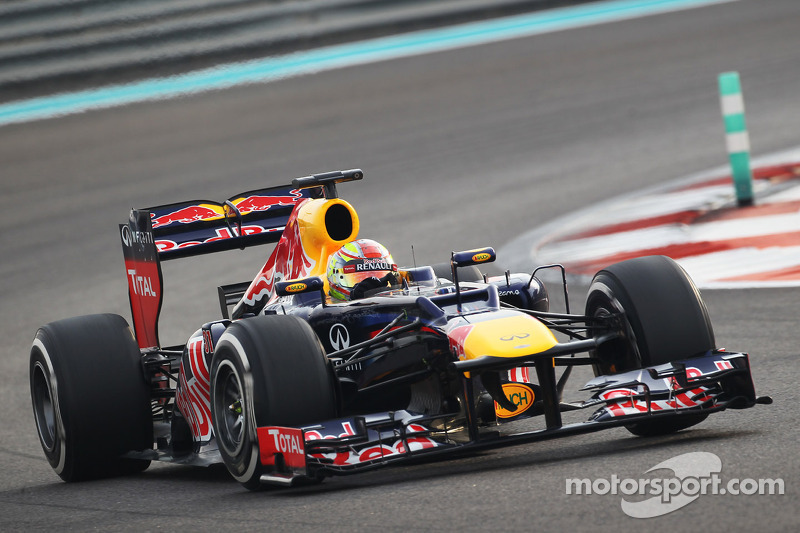 Despite his turbulent 2013 season Frijns was allowed a glimmer of hope going into 2014. His F1 career was rescued thanks to the back marker Caterham team, who appointed him their reserve driver. Whilst it must of been frustrating to have Swede Marcus Ericsson ahead of him in a race drive, considering he’d beaten him on occasion in GP2 the year despite his lack of budget, he could at least say he remained in F1. One of the rare occasions Frijns was behind the wheel of a Sauber in 2013. Here he is at the mid-season young driver test at Silverstone. Photo sourced from Worldcarfans.com . Sadly for Frijns his bad luck from Sauber followed him to Caterham, as he only drove in two practice sessions for the team. He drove in Bahrain and Britain, yet the team were taken over mid-season with chronic financial issues. This left Frijns washed up and seemingly out of F1 for good now. Whilst the future in single seaters looked bleak for Frijns at the ripe old age of 23, his talent would take him in a different direction. He was handed a lifeline by the Belgian WRT GT racing team, who offered him a test at the end of 2014. His impressive showing was enough for WRT team principal Vincent Vosse, a former GT driver, to offer him a drive with his Audi works supported team. Partnering fellow single seater convert Laurens Vanthoor for the Blancpain Sprint Series and Jean Karl Vernay supporting them in the Blancpain Endurance Series, he was for the first time in his career a professional racing driver. After a small hiccup at the opening round of the Sprint series, Frijns took to GT racing and his Audi R8 LMS like a duck to water. An even rarer occurrence. 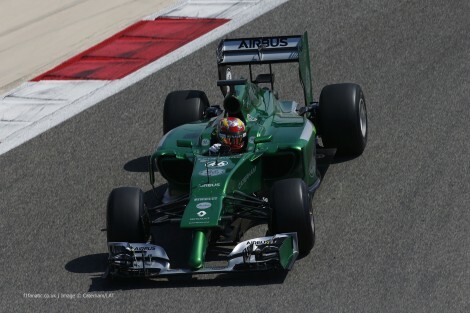 Frijns behind the wheel of a Caterham in 2014. Here he is in Bahrain free practice. Photo sourced from F1fanatic.co.uk . Copyright Caterham and F1. 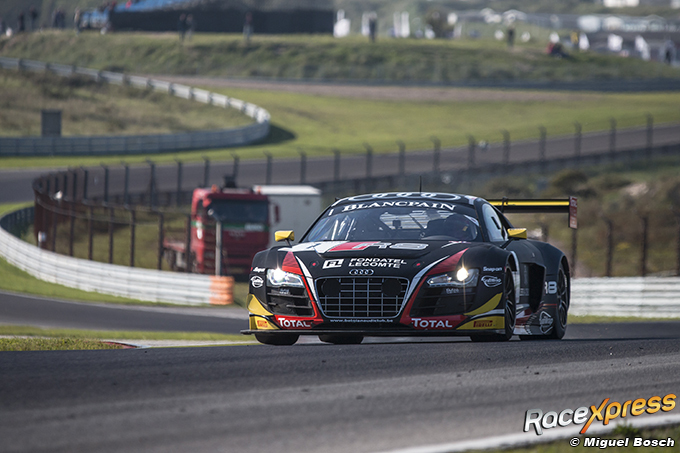 Ably led by Audi GT superstar Vanthoor, Frijns was able to secure the combined Blancpain GT series title at Zandvoort last Sunday, despite missing Vanthoor thanks to an injury several weeks ago which prevented him from claiming the title with Frijns. Now is where we go full circle, as I mentioned at the start of the article. Whilst Frijns was claiming the Blancpain GT title last Sunday, his talents should have propelled him to a place on the Russian Grand Prix grid last Sunday. Thanks to extreme bad luck and a lack of funding it hasn’t happened for Frijns in F1 yet. For now his story joins a long list of very talented young drivers who should reach F1, but don’t for whatever reason. For now Frijns must be content with a growing reputation in GT racing with WRT and Audi, along with a recently announced drive for Andretti Autosport for the second season of the Formula E championship. This new electric series is growing and could offer Frijns a chance to showcase his talents to the single seater community. One thing is for sure though. Motorsport fans will hear a lot more about Robin Frijns for the duration of his career. Frijns on his way to the Blancpain GT series title last weekend at Zandvoort to complete a great first season in GT racing. Sourced from RaceXpress.nl copyright Miguel Bosch . What are your thoughts on this article? Please feel free to comment below and thank you for reading. Today the news finally became official, the ongoing and high profile dispute between the Sauber team and Dutch driver Giedo van der Garde came to a close with a statement from van der Garde announcing a settlement had been reached with the team. If you don’t follow F1 and don’t know the backstory to this dispute let me give you the key details. Giedo van der Garde was the Sauber teams reserve driver last year, and in the middle of last year the team signed him to a race deal for this year. Van der Garde confirmed the rumors in his statement today, that his personal sponsors paid their fees for this year up front on the signing of his deal last year, in an effort to help the financially struggling team through the season. Therefore I expect van der Garde was suitably angry and confused when it was announced late last year in quick succession that the team had also signed Swede Marcus Ericsson and Brazilian rookie Felipe Nasr. It doesn’t take a math expert to know three F1 drivers can’t drive two cars, with van der Garde becoming the fall man for the team. This is where things turned ugly as van der Garde brought his case before the courts, first in Switzerland and then in Australia last week. In both courts he won the case, with both courts ordering Sauber to give him a race seat for this season. When understandably Sauber began to baulk at this order in the build up to last weekend’s opening Australian Grand Prix, van der Garde went back to court to get a contempt of court order, effectively forcing Sauber to give him a drive or the teams assets would be seized by bailiffs and key team members could be arrested. This sorry saga was fast becoming a soap opera, although thankfully before qualifying last Saturday common sense prevailed, with van der Garde announcing that both he and the team entered talks on a settlement, with van der Garde giving up his right to drive last weekend. Talks between the two parties quickly developed to the stage were at today, with van der Garde announcing that a settlement had been reached. Whilst he did not disclose the specific details today, it’s believed he has been paid 15 million Euro’s to cancel his contract and allow the team to continue with Ericsson and Nasr. For the cash strapped team this is a huge sum to pay out, although is only fair considering the sponsor money paid to the team last year and compensation for canceling his contract. It was remarkably refreshing this morning to read his statement, where for once in modern day Formula One a driver was honest about the situation to the media, a far cry from many modern drivers PR driven stance which would have yielded a statement with plenty “no comment” mantra’s, and frankly would have been more useful to the specialist media as toilet paper. Whilst the future remains unclear for van der Garde in motorsport, he can at least take solace that he has gained a lot of respect amongst the motorsport community for his class and dignity throughout this whole sorry saga with Sauber. Van der Garde can hold his head high that he did nothing wrong in this matter, it’s Sauber who have come out of this matter with their reputation severely diminished. This also is a shame for what was previously one of F1’s highest teams in terms of class and dignity amongst the F1 paddock. What are your thoughts on this matter? Please feel free to comment below all comments will be appreciated both good and bad. Last week’s build up to the United States Grand Prix was dominated by the devastating news within the space of a few days that the lowly Caterham and Marussia teams had both entered administration, and were going to miss at least the next two races if not more. The reaction amongst the F1 paddock is exactly why these two teams went into administration in the first place. Whilst the top teams and personnel such as Bernie Ecclestone believed it was unfortunate that both went into administration, they also felt there was little they could do to change the spending culture of F1. On the other hand, midfield teams such as Sahara-Force India and Sauber have used both teams as an example of why the revenue streams within F1 need to be changed to make it more sustainable for the lower teams. The only exception at the top calling for change in F1 is FIA president Jean Todt, someone who made known his frequent frustration with failed attempts at a cost cap, something which he feels F1 needs to reduce it’s budgets by roughly 30-40% to make F1 sustainable. This statement from Ecclestone does seem a slight understatement, as it’s believe last year Ferrari earnt $200 million, $90 million of which was fully guaranteed before they even turned a wheel, yet Marussia received only $14 million for completing the whole season as Caterham earned nearly $28 million dollars. For there to remain a steady stream of teams in F1 this clearly needs to be rectified, especially as F1 keeps pushing this green initive starting with vastly more expensive engines for this year. The uneven revenue structure for the teams currently in F1 only enhances the vicious circle of F1 whereby the best teams get the highest money from FOM, therefore they usually produce a faster car because of their larger budget, which then ensures they further enhance their prize money awarded by FOM. This is only making the performance gap from the top to the midfield teams even bigger, with the likes of Sahara-Force India and Sauber struggling to keep racing competitively this year. This vicious circle goes back to the late 1990’s and early 2000’s, when manufacters such as Mercedes, Ferrari,BMW, Peugeot, Honda, Renault and Toyota all invested heavily in Formula One. This constant drive for success led to a spending war to which F1 is only just reeling from. Despite most of these manufacters leaving the sport by 2010 the biggest teams such as Ferrari, McLaren,Red Bull and AMG Mercedes have regularly spend over £185 million pounds a year to retain their competitive advantage. With teams like Sauber operating on a budget of £90 million, it’s easy to see why they struggle so much to match the top teams. This financial model has been in place for several years now, however it’s only this year that it’s rearing it’s ugly head on a large scale. Whilst the demise of the Hispania team after the 2012 season was soon as no more than a backmarker team running out of money, the sudden demise of both Marussia and Caterham has finally showed F1 has a huge financial problem on it’s hands in the next few years. The introduction of highly expensive new turbo engines for this year has ramped out costs, which alongside a constant struggle to find sponsorship in F1 after the financial crisis in 2008, has led to the current situation where half the grid are struggling to pay the bills as the other half refuse to take any significant steps to stop this. If F1 continues to use it’s current revenue model, we could very soon be seeing a grid of 14-18 cars of which Ferrari,AMG Mercedes, McLaren and Red Bull all supply the rest of the grid with third of even fourth cars. All the while the likes of Sauber, Sahara-Force India and Williams will be consigned to the history books as teams who simply ran out of money. As a passionate fan of F1 this would be a huge shame for the sport if we were simply to have three or four manufacters supplying the whole grid, which somehow doesn’t carry the same appeal of a grid containing 9-10 teams such as Sauber. Still, it would make a lot of money for the teams in extra sponsorship and give them a better portion of the teams prize money so their main priority would be boosted. That’s a crying shame for what is described as a sport, if it’s eventually money which strangles the sport, leaving hundreds of millions of fans and thousands of employees feeling lost.